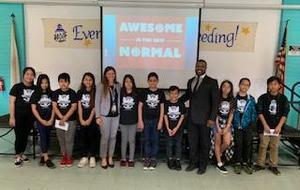 Willmore Elementary earns the distinction of being certified by Common Sense Education through the use of its digital citizenship program. All students from Transitional Kindergarten through fifth grade completed a comprehensive curriculum to prepare them to be responsible consumers and creators of digital media. Click on the headline to read the entire story. 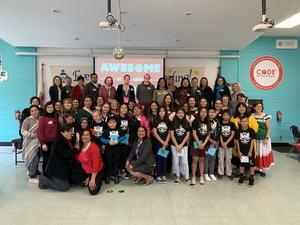 The California Association for Bilingual Education came to visit Willmore's dual and coding program on the opening day of the conference. Forty teachers and administrators walked classrooms to observe our program! 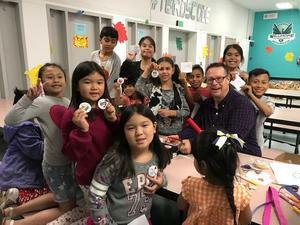 Westminster School District is committed to help students take ownership of their digital lives. 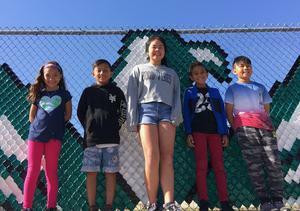 At Willmore, students show 21st century skills through innovation and creativity. Students had the opportunity to showcase their coding projects in Kindergarten through fifth grade on Friday, February 1st. Parents were impressed with what are students are capable of at Willmore! You’re invited to be part of the future of Westminster School District by joining us as we work together to develop the District plan. Please click on the link above to see the flyer with detailed information. As part of the California school funding model, each district will annually develop a Local Control Accountability Plan (LCAP). Your input to the plan is very important. Westminster School District is hosting a community meeting to share information and to get input for the District plan. You are invited to attend any of the meetings; interpreters will be available. Please complete the district LCAP Survey to give your input as the school district and school value your opinions! You can choose any of the ways below to give your feedback. -Please go to the Westminster School District Website at www.wsdk8.us and click on the LCFF/LCAP link on the right to complete the Local Control Accountability Plan (LCAP) survey. -You may also see Aida and Ryan in the front office to use a computer or fill out a paper copy in English, Spanish, or Vietnamese. Thank you for your input! Willmore TK/Kindergarten Information Night on Wednesday, January 30th! Click on the link to see our flyer with important information and details. Come to hear about all of the amazing programs at Willmore at our TK/Kindergarten Information Night on Wednesday, January 30th at 6:30 pm in the Willmore Multipurpose Room. 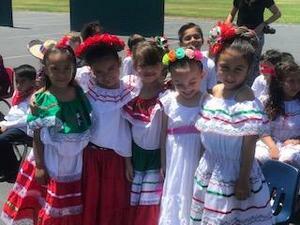 Willmore Language Academy provides all students with the opportunity to become multilingual, multi-literate, and multicultural global citizens. Our program emphasizes and promotes the acquisition of three languages: English, Spanish and Coding. Through the partnership with Code to the Future, students have opportunities to develop their critical thinking and problem solving skills. According to the U.S Bureau of Labor Statistics, there will be a one million job gap in computer science by 2020. Our language academy prepares for 21st century learning, as well as college and career opportunities that will lead to success in a global economy by giving students the skills that the future demands. We are looking forward to seeing you on January 30th. Please see the attached flyer and contact the school at 714-895-3765 for questions or to set up a tour! Willmore's first annual Fall Festival was a success. Thank you to our dedicated, committed PTA for all of your hard work in creating this community celebration for our families. Last week, Willmore elected our student council officers. The purpose of the student council is to offer student leadership opportunities by allowing them to help govern the student body. Our student council helps share the ideas, interests, and concerns of students with teachers and the principal. They help organize spirit days and run fundraisers for our school. The elected officers are in charge of leading the meetings under the guidance of teachers Mrs. Shook and Ms. Pyle. In addition, they help lead the school in our weekly Community Gatherings with Dr. Jacobson. Willmore Students Learning to Code: A Key to the Future! Our students are becoming multilingual, multiliterate, multicultural citizens in our Spanish/English Dual Language Immersion Academy. We are proud to continue in our 2nd year of coding immersion at Willmore Elementary School as well this year. All of our Transitional Kindergarten through fifth grade teachers have been trained by the wonderful Dr. Martin, and are motivated to bring the excitement to all of our amazing students. All students are learning block based coding and are highly engaged in class. They are learning how to persevere and use logic in our 21st learning environments. We are committed to bringing the best possible education to our students at Willmore Elementary School! Click on the headline to see our students coding in action! Willmore Garden Comes to Life Thanks to PTA and Home Depot! We are excited to announce the opening of our new garden. Thanks to our continued, strong partnership with Home Depot. Home Depot brought employees and managers (local and regional) who came to dig and build planters. Students also were able to put soil and flowers in pots to take home. What a great experience for our students and families! Click on the headline to see our video!